We know how important your telephone is for your business. We provide reliable, innovative solutions designed for your business needs. We provide quality on-site telephone service to Greater Victoria, Sooke, Sidney, Duncan, Nanaimo, Parksville, Courtenay, Comox, Campbell River, Port McNeil, Port Hardy and anywhere else on Vancouver Island and the Gulf Islands. We also provide remote dial in service to almost anywhere. We have Lots of gently (and not so gently!) used telephones and telephone systems. If your company needs to save $$$ then call or email us with your needs. We've got parts and service available for most telephone equipmenmt including Avaya, AT&T, Comdial, Lucent, Mitel, Nortel, Norstar, NEC, Panasonic, Toshiba, Samsung and Vertical telephone systems. Wondering about the quality of VOIP calls? We are always playing with VOIP lines and systems. Call our SIP line at 250-220-6972. This line is answered by our AastraPro 160 system. If you have a Skype account but can't get a Skypein Canadian number we can help you. We have a Canadian Skype number forwarded directly to Skype messenger using a Dlink DPH-50U analog adapter. This number is answered by our Aastra Pro 160 system. Call us toll free at 877 479-8585 for the number and give it a try! Microsoft Response Point is an advanced IP software-based telephone system developed by Microsoft. Response Point software runs on Aastra, Dlink and Syspine hardware platforms. The system features a voice recognition Auto Attendant, Voice activated dialing, Click-to-Call Dialing, SIP trunks, standard lines, T1/PRI and analog station support and a host of other features. Ask for Bill, the call will ring my desk phone once and then transfer out via a SIP trunk to my cell phone. This Hybrid telephone system is designed by LG-Nortel and made for your growing business. We have installed many of these systems and found they are an excellent product that's easy to use and very reliable. This Hybrid phone system is designed to use a Vertical Digital phone or a regular telephone, cordless phone, fax, modem or interac machine. Now you can easily use your fax line for outgoing calls and eliminate the costs for dedicated interac lines. There's a huge set of features like Caller ID, 15 Party Conferencing, Hunt Groups, Call Queuing, Auto Redial, Call Forwarding. Voice card for Voicemail, Auto Attendant, Call Recording, and more. Speed editor software is included for easily adding speed dials. There's also a free trial for the ezphone desktop manager. This easy to use software lets you use your PC to control your phone. the system expands up to 12 lines and 32 stations and up to 72 systems can be networked together. 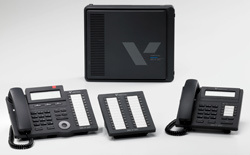 Are you looking for a "Plug and Play" telephone system? 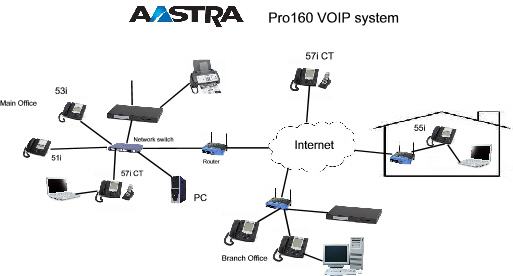 Have a look at the flexible AastraPro 160 IP phone system. These phone systems self configure themselves.as soon as they are connected to your network and can be easily customized using a web interface. The system is designed for the end user to install and maintain and is has a great set of features. A large assortment of phones are available, making this a very flexible IP solution. We can assist you with almost any any phone products or telephone service. If you don't find what you're looking for on our site please call or email us. We sell and service Telephone systems in Victoria and beyond! The best Music on Hold system! A SIP trunk is an outside line that uses your internet connection. These telephone lines offer inexpensive long distance rates, and often advanced features that the phone company can't offer. The voice quality is usually quite good and a great solution if you need extra telephone lines. What's a VoIP or IP phone system? An VoIP phone system is a telephone system that plugs into your computer network instead of using dedicated wires. Plug and play systems are self configuring systems and a great solution for Small Offices or Home Offices. Hybrid systems such as our Vertical SBX IP 320 use dedicated wiring for regular telephones and digital telephones. Some systems can also use IP phones. You get the quality and reliability of wired technology and can add IP capability at any time.